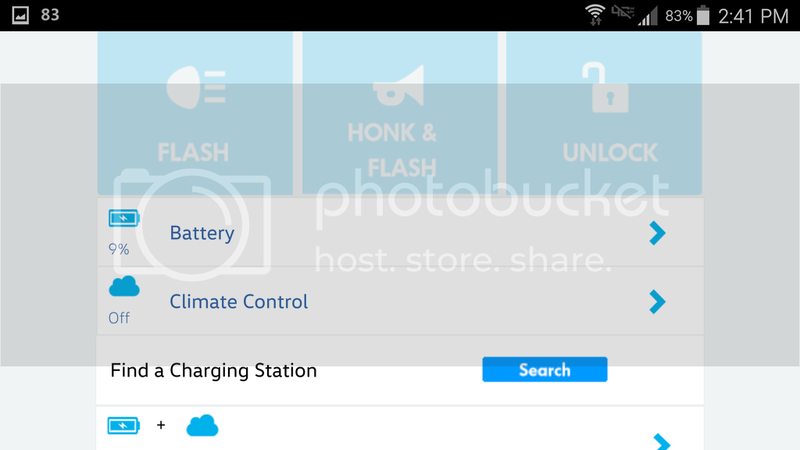 If you are getting 4 miles /kwh on average, take it down to 4 miles left, as an experiment, and see what it indicates left % on your phone, and what it all calculates out to for capacity. An approximate 700,800, 900 and 1,000 days in service might not be a bad idea to mark on the calendar, if it's not too much trouble, to check trend analysis. I will probably try to take data about once a week and at as many different battery levels as possible so that there is more data to judge by. There is a lot of uncertainty in these calculations, so having a good point cloud should help to bring out the real trend. Getting the car down to very low SOC actually takes some effort. We only got down to 8% because I forgot to plug the car in after my wife had an unusually busy day driving around. I took the car the next day and found a place to charge it at lunchtime, just enough for the rest of my day of driving. Just before that charge was the 8% remaining, so it represented two days of driving. I would expect that a longer period of use between charges would introduce more uncertainty in the calculation. Why did the initial usable capacity change from one chart to the next? Did I miss the explanation? 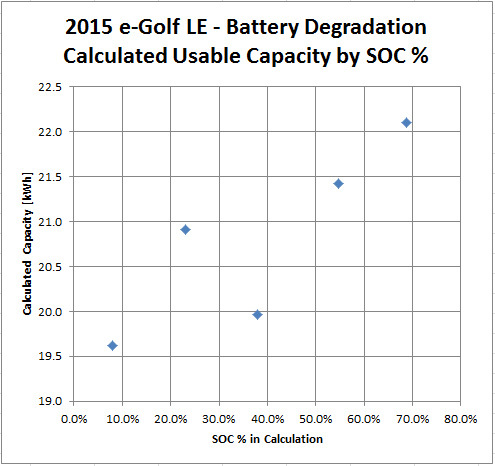 Also, somebody suggested the the usable capacity calculation seemed to vary by how much of the battery had been used. So, I made a scatter plot of the calculated capacity by SOC % remaining. So, it looks like there is a definite correlation there. Anyway, I will take data more often so I have a better cloud of data and we will have a better correlation to the actual capacity over time. I think the small number of data points led to an improper conclusion about the trend. However, it's still worrying to me that when you use almost all of the battery, the indicated total is less. I'm confused by the bolded section. I read the second graph to say the opposite - the larger percentage of the battery that you use, the greater the indicated total capacity. This seems like a good idea to me, that is, to be conservative with the estimated remaining charge. Am I missing something / reading this wrong? The chart shown above shows the SOC remaining in the car which is used to calculate the total capacity. So, the more you have remaining, the larger the calculated total is. However, there may also be a time component, since the highest SOC value is the oldest (when the car was newest). This is why I want to collect more data from this same car so that I can separate the time effect from the SOC effect on the calculation. Last edited by miimura on Fri Jul 14, 2017 3:43 pm, edited 1 time in total. Taking off driving on a hot, just freshly fully charged battery, in my estimation will add a few miles of range. 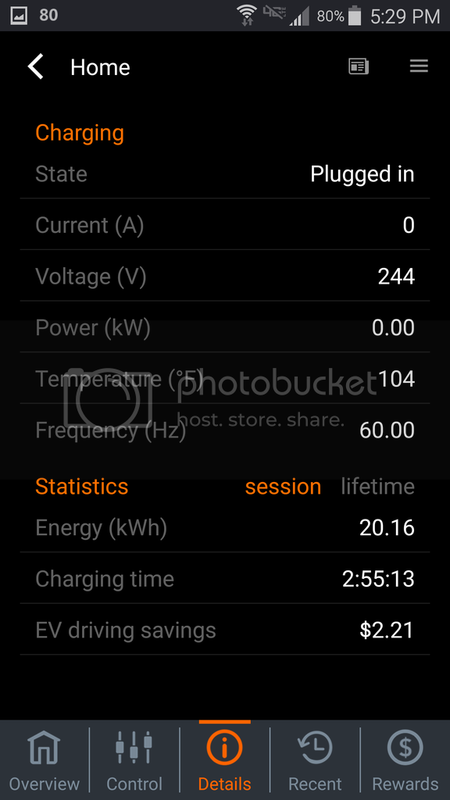 20.16kwh taken out of my e-motorwerks Juicenet Pro 40, the battery probably only gets 90 to 91% of that actually into recharging the battery. 121 miles estimated range this time once fully charged. 99/5.6 = 17.679 kwh @ 91% = 19.427 kwh remaining battery capacity. 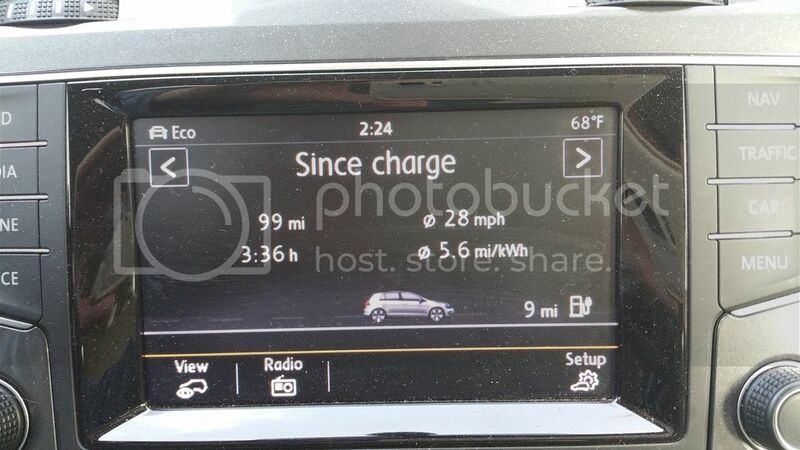 We have almost 27K miles on our '15 SEL, and we have no discernible capacity loss. None. And the largest charge is about 22kWh. I don't know where any of these other number are coming from. You cannot guess about wall-to-wheel losses. Ok, thanks. I was just reading it wrong. I thought by "% SoC" you meant the percent used in your calculation, not the percent remaining. My bad. Is anyone else still checking their battery degradation besides mimura? With warm ups into the mid 70's to low 80's, my guess o meter has bumped up into 123 to 124 miles of range on a full recharge. 10,300 on the odometer currently, 18 months of ownership April 6th.